As Apple releases new versions of the iPhone there are plenty of phones–those that have been discarded for not running the latest apps or holding a charge all day–filling our landfills. 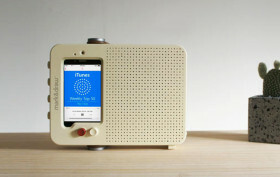 But Korean design studio PlusD is tackling the issue with their innovative i Ready O, which can turn any old iPhone into a new, cool radio. With minimalistic aesthetics inspired by the classic Dieter Rams designs for Braun, this object hacks Apple’s planned obsolescence with sustainable design.